Oh my goodness, these Gluten Free Cheddar Bay Biscuits were heavenly! They were so good I wanted to eat ALL of them! 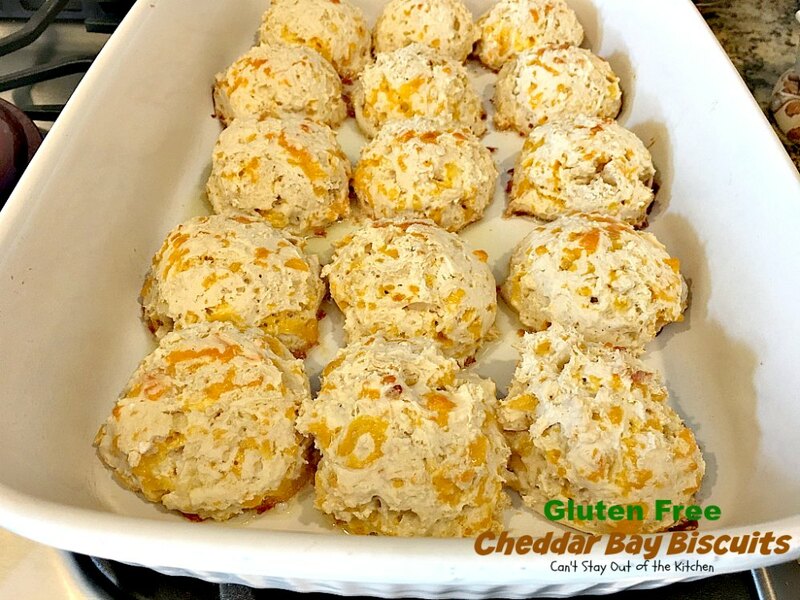 These Cheddar Bay Biscuits use an Artisan blend gluten free flour, and more wholesome ingredients than the original recipe. 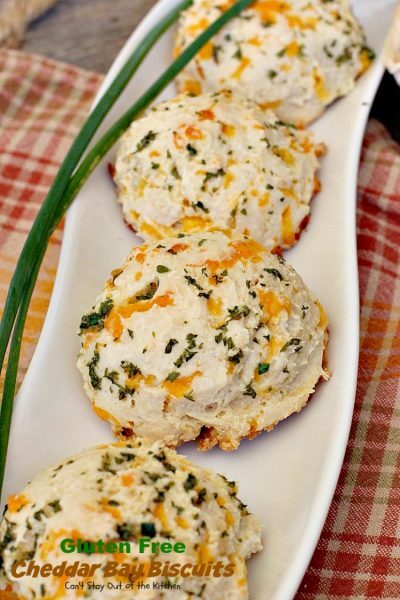 But they still have that dynamite taste of cheddar cheese, garlic powder and parsley that give the biscuits their distinctive flavor. 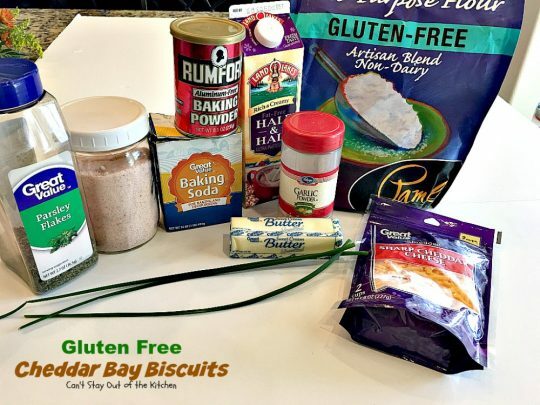 Honestly, if you didn’t know you were eating gluten free biscuits, you’d never know because the taste and texture is sooooo wonderful! After baking up a batch of these jewels, I could have sat down and eaten all of them with apple butter for breakfast, lunch or dinner for the next couple of days. Thankfully, I only ate a couple of them for our Thanksgiving dinner and another one with soup the next day. Then I froze the rest and ended up giving them to friends after Thanksgiving along with a Turkey Corn Chowder and some Pumpkin Muffins because they had been sick over the holidays. 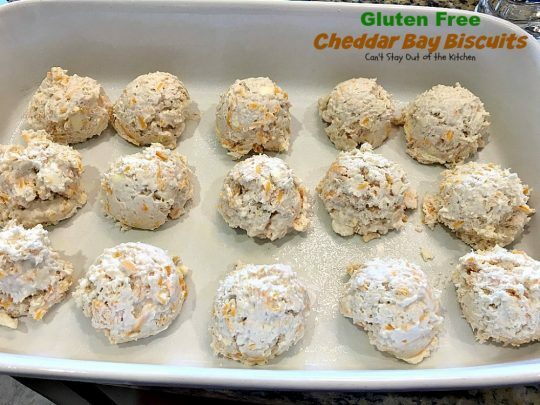 This recipe turned out so well, I will probably make this version of Cheddar Bay Biscuits often in the future because they are so good. Can I go on record and say that I would eat these biscuits every single day for every single meal all year round if I could get away with it? 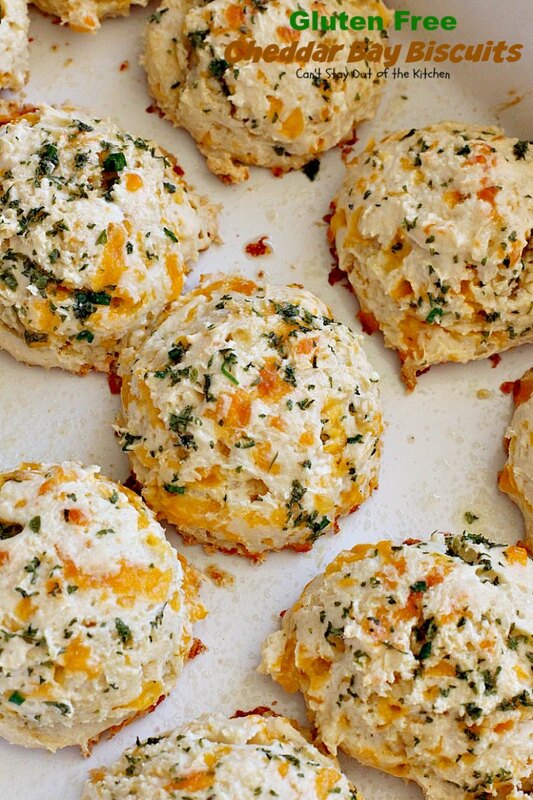 I absolutely L-O-V-E these biscuits. 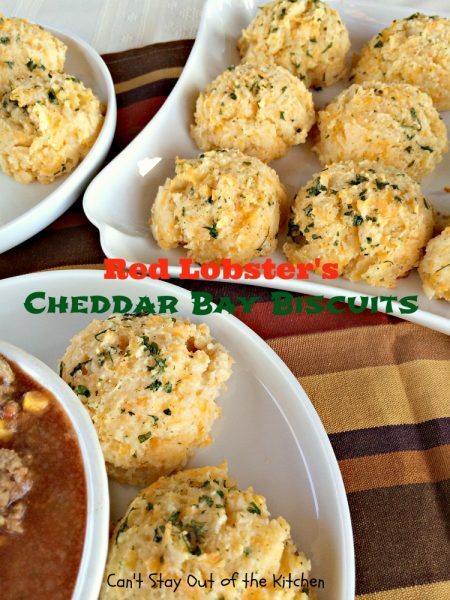 Occasionally when I make them I use one and a half times the butter sauce on top, when I want the biscuits drenched in that amazing garlicky butter sauce. They are so perfect for any kind of side, that I can’t rave about them enough. I actually enjoy these more than the original recipe with regular flour. Because that recipe uses Bisquick, I’ve experimented with the leavening ingredients trying to get these biscuits just right. 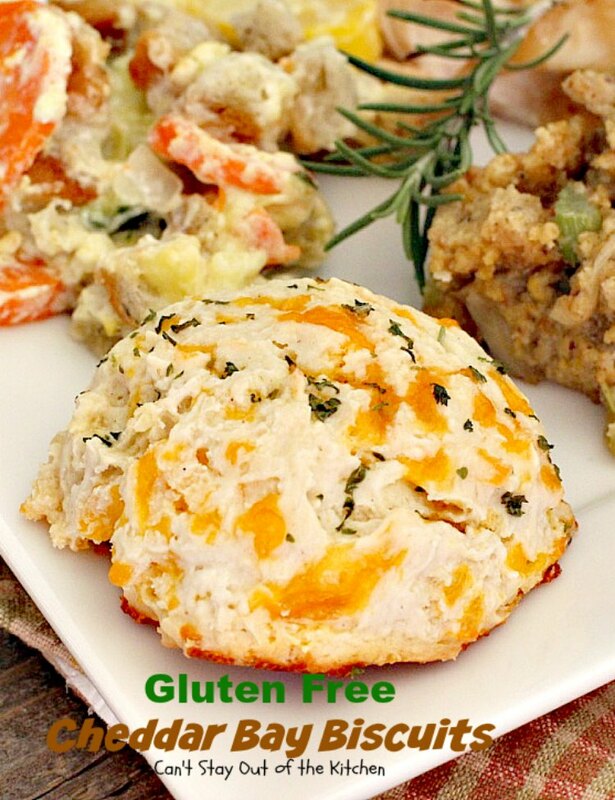 When I made our traditional Thanksgiving dinner this year, I kept it pretty simple. In addition to turkey and gravy, I made up a Squash and Carrot Casserole, Cornbread Dressing, Greek Salad and these Gluten Free Cheddar Bay Biscuits. I had so much leftover turkey and turkey broth that I made four additional soup recipes. Plus, I gave some of our turkey and broth away to those friends who had been sick so they could cook up some of their own meals. Gluten Free Cheddar Bay Biscuits are awesome. I found them especially delicious with butter and apple butter. These biscuits puff up big and have an explosion of cheesy, garlicky flavor that’s wonderful. While these biscuits are traditionally served for dinner, I loved them for breakfast or snacks with apple butter. 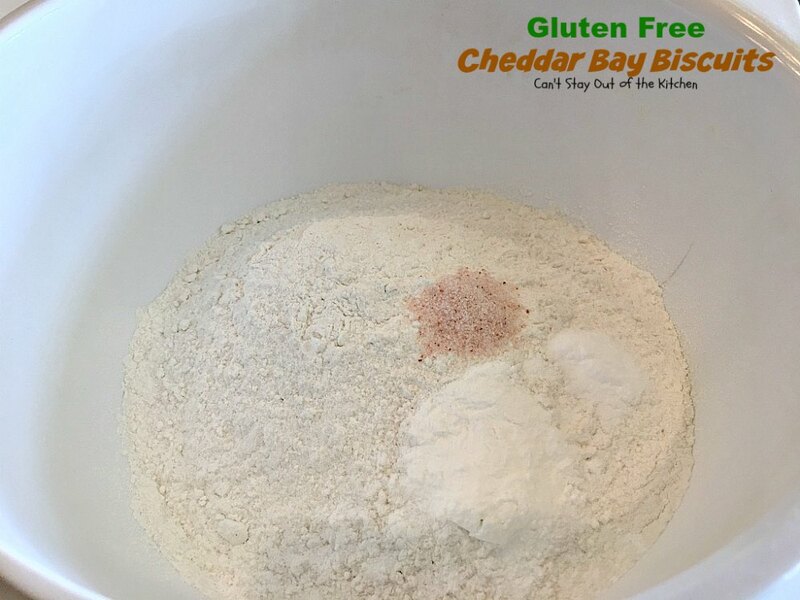 Place Artisan blend gluten free flour in a large mixing bowl. Add salt, baking powder and baking soda. Stir to combine. Cut in cold butter with a pastry blender until coarse crumbs form. Don’t over mix. 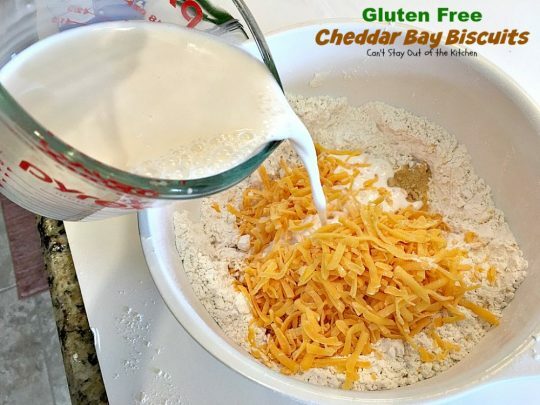 Add cheddar cheese, half-and-half and garlic powder. Stir ingredients with a wooden spoon to combine. Stir just until moistened–don’t over mix or over handle the dough. Spray a 10×15″ baking dish or cookie sheet with cooking spray. Scoop biscuits with a large ice cream scoop and place an inch or two apart on greased cookie sheet or baking dish. Bake at 400 degrees about 13-15 minutes until lightly golden brown. (Mine took 20 minutes). 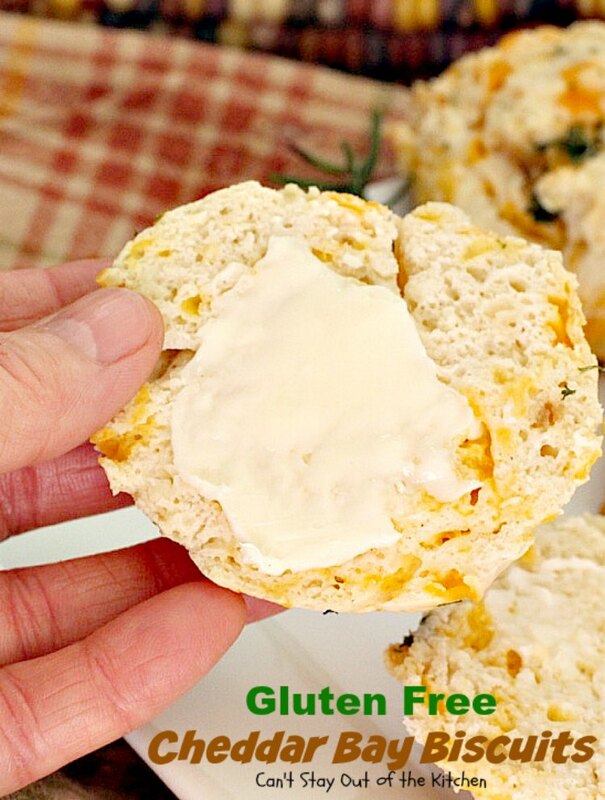 While biscuits are baking combine glaze: Melt butter. Add garlic powder, parsley, salt and chives. Stir to combine. Brush butter ingredients over top of hot biscuits as soon as they come out of the oven. Coat well. 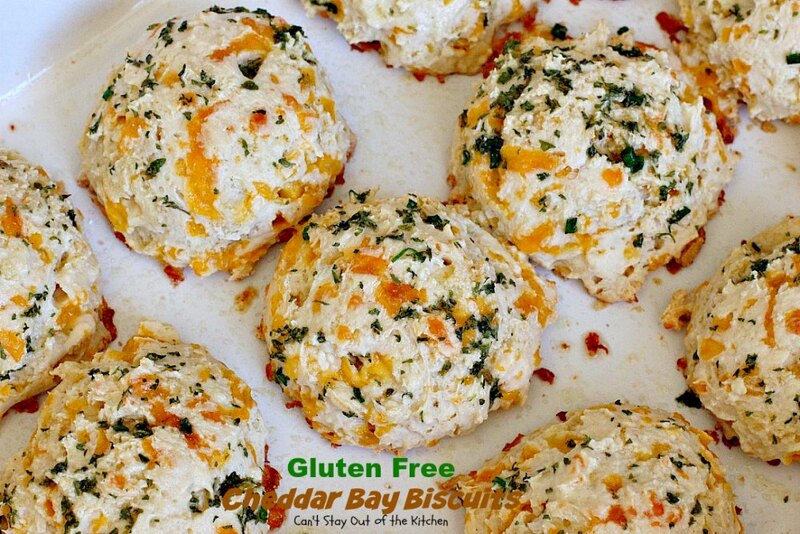 Serve Gluten Free Cheddar Bay Biscuits for dinner with your favorite meal, or for breakfast! 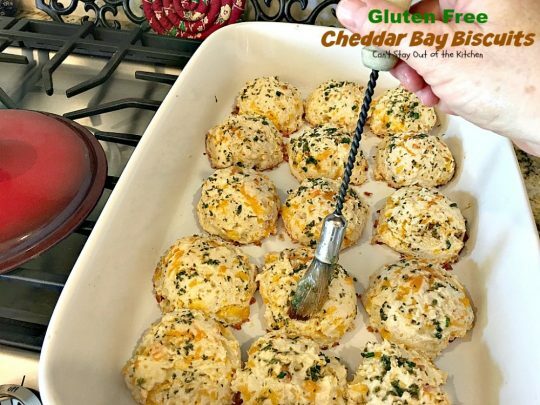 This uncomplicated version of Gluten Free Cheddar Bay Biscuits is a great way to get your biscuit fix without the gluten! 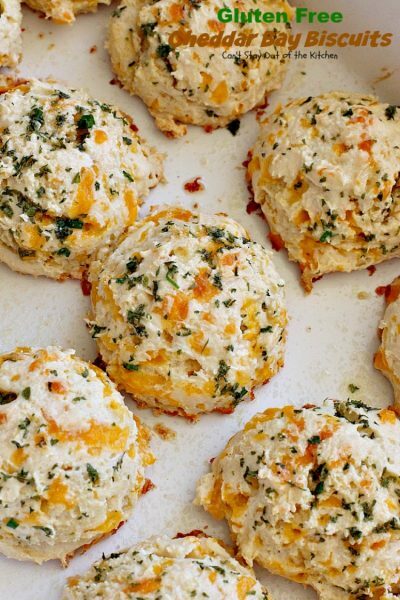 If you love biscuits, you’ll love these! 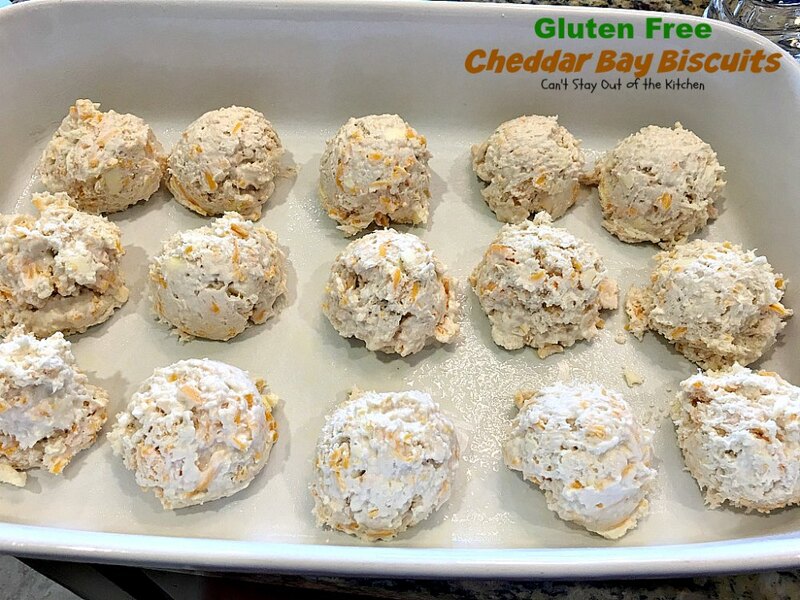 Gluten Free Cheddar Bay Biscuits were wonderful served with butter. 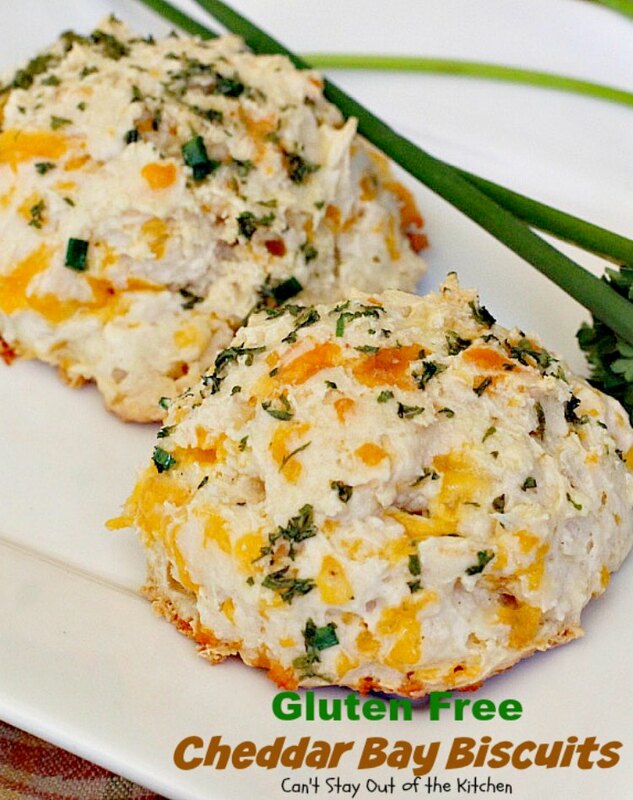 These amazing Red Lobster copycat Cheddar Bay Biscuits are made with gluten free flour and taste divine. You'll never know you're eating gluten free with the texture and taste of these delicious biscuits. Great for breakfast or dinner. Spray a cookie sheet with cooking spray. Combine gluten free flour, baking powder, baking soda and salt in a mixing bowl. 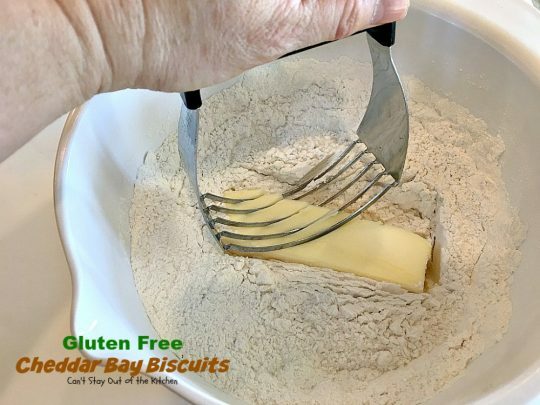 Cut in cold butter using a pastry blender. Stir gently with a wooden spoon until combined, but don't over mix. Drop 1/4 cup portions of the dough onto the lightly greased cookie sheet. 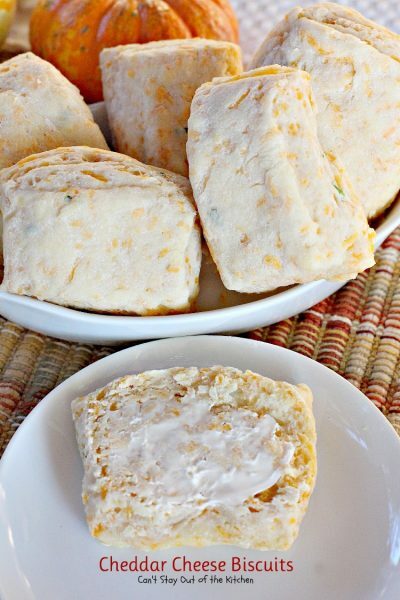 Bake for 13-15 minutes in preheated oven until the tops of the biscuits begin to turn light brown. While the biscuits are baking, melt butter is a small bowl in the microwave. 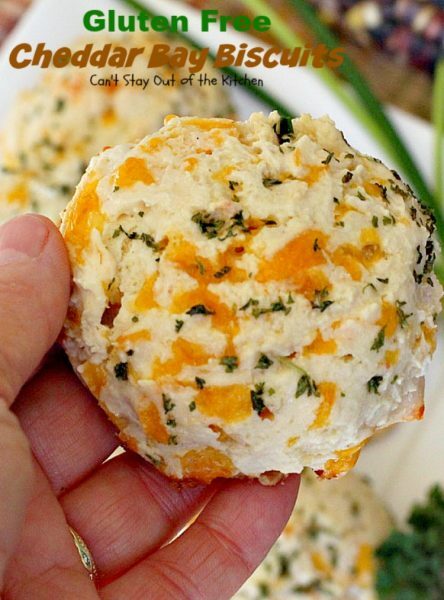 Stir in garlic powder, dried parsley flakes, chives and 1/3 tsp. salt. 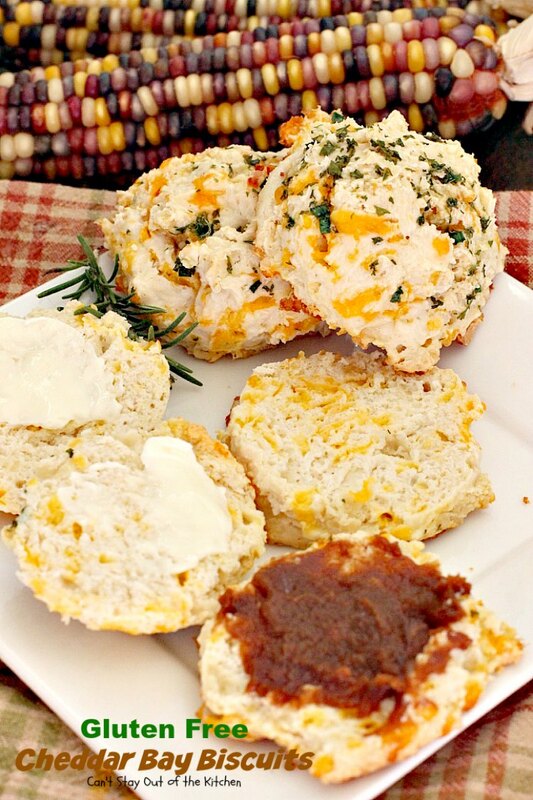 Use a brush to spread the garlic butter over the tops of all the biscuits. 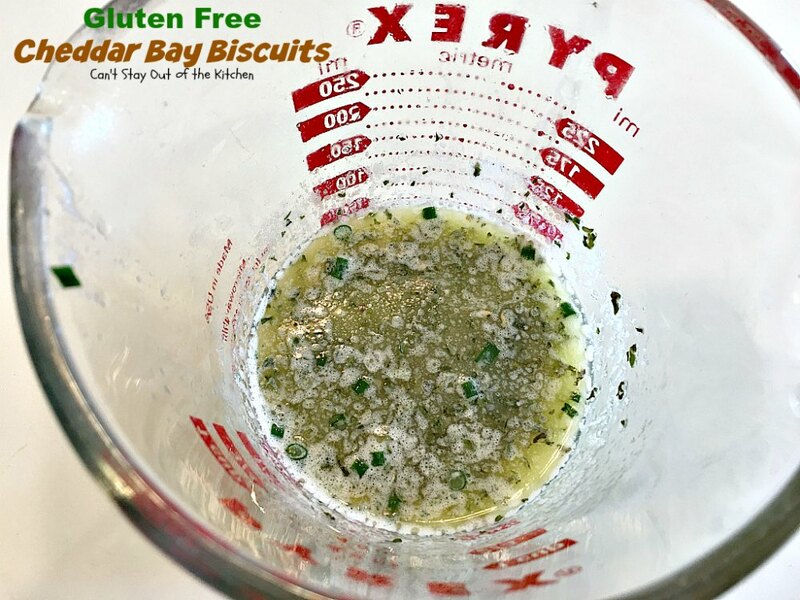 Sprinkle a little additional sea salt on the freshly coated biscuits. NOTE: If you use milk rather than half-and-half you will need to decrease the amount by almost a half, as you will not need as much to make the batter moist. NOTE: I don’t use my lower oven very often, so these biscuits cooked slower. They took over 20 minutes to cook completely. NOTE: This mixture will not work for regular all-purpose flour. You will have to decrease the half-and-half significantly because regular flour doesn't absorb the liquid the same way gluten free flour does. NOTE: If I want to drench the biscuits in the garlicky butter sauce, I use 6 tbsp. unsalted butter, melted, about 1 1/4 tsp. garlic powder, 1 1/2 tsp. parsley, 1 tsp. sea salt and several large fresh chives, snipped. 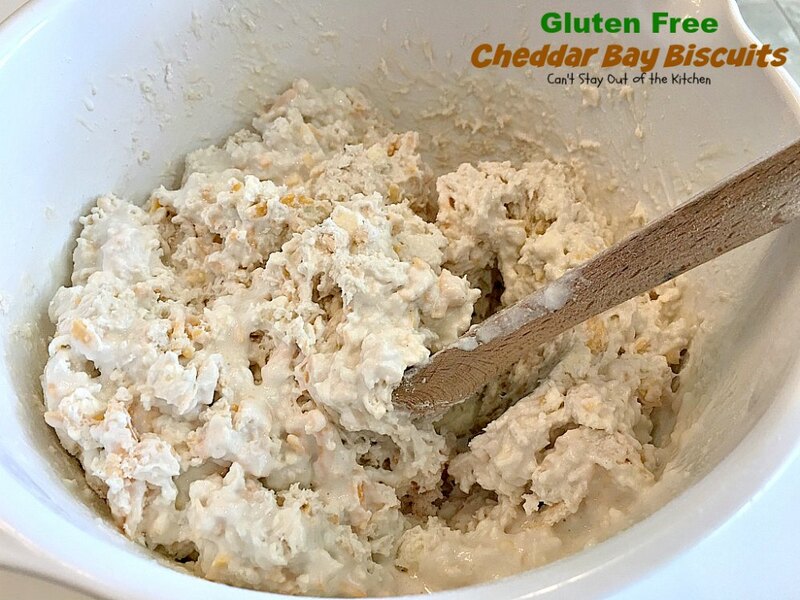 Brush butter mixture generously on top of biscuits after they come out of the oven. NOTE: If you want the biscuits to spread a little more, use 1 1/2 tsp. baking powder. 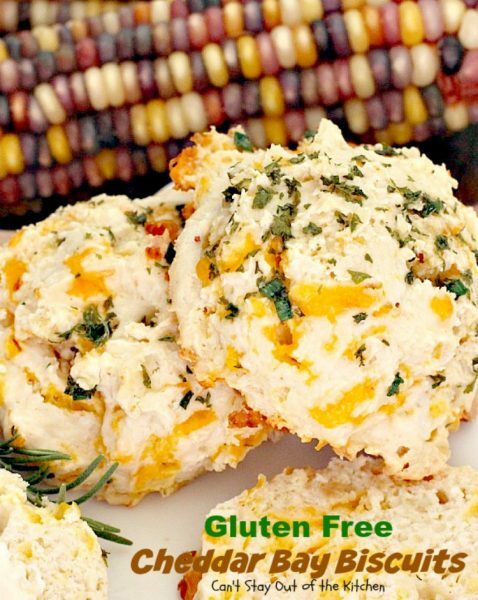 Gluten Free Cheddar Bay Biscuits were wonderful served with a bowl of Turkey Corn Chowder. The nice thing about these biscuits is they’re a drop biscuit, so they are quite a bit quicker to make than biscuits you have to knead and shape. Just scoop the dough with an ice cream scoop and place on a cookie sheet and the biscuits are ready to go! I served Gluten Free Cheddar Bay Biscuits for our Thanksgiving Dinner with Cornbread Stuffing, Squash and Carrot Casserole, Greek Salad, Turkey and Gravy. They were mouthwatering. Here I’ve spread the biscuits with butter and apple butter. They were so incredibly scrumptious. I made these and they are wonderful! Moist and FLUFFY! I had an issue with the milk..I used 2% milk and the recipe note say to decrease the milk if not using half and half…I had to double the amount of milk to get that rich sticky dough. I only had the taco blend cheese but it gave it a good flavor without changing the biscuit flavor. I didnt have parsley so I substituted some dill and wow it added a really nice flavor. 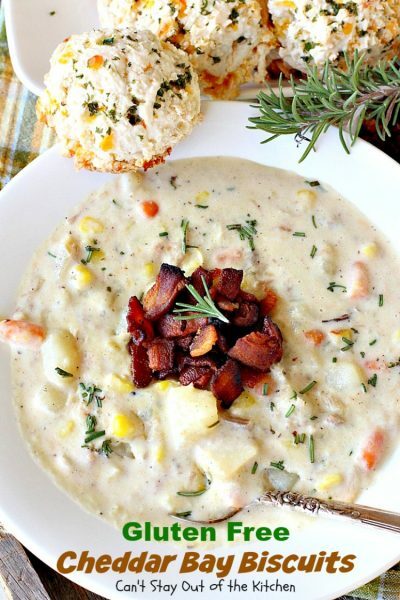 Thank you for this amazing recipe! Hi, Angel. I’m so glad it turned out for you. When I tried it with 2% milk the biscuits lost their round texture and flattened out too much (using the same amount). That’s why I said you may not need to use as much. Grateful you enjoyed the recipe. Thanks for sharing.